The Franco-Dutch freight carrier has widened the scope of its digital quotation and reservation platform ‘myCargo’, enabling the market to book pharma shipments in addition to standard freight. 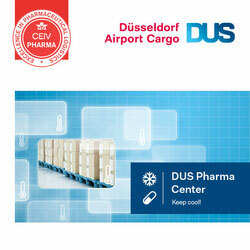 The data, allowing status visibility of pharma active containers, are retrieved at the carriers’ hubs in AMS and CDG and displayed on their online platform. By the end of this year or the beginning of 2019 latest, all 100-plus international destinations served by AFKLMP that handle active cool containers filled with pharmaceuticals will become part of the monitoring offering. “Transparency” has meanwhile become the key catchword frequently used by the AFKLMP staff responsible for the pharma business. “Transparency is what pharmaceutical logistics customers need for their precious shipments, before, during and after the consignments are transported,” Enrica Calonghi, Global Head of Pharmaceutical Logistics at AFKLMP Cargo confirms the terminology in a telephone call with CargoForwarder Global. Following a thorough test series, AFKLMP have added two new features to its portal ‘myCargo’ tailored to the requirements of the pharmaceutical industry. A technical precondition, enabling pharma customers to make quotations and reservations directly online. States Ms Calonghi: “This way we guarantee transparency on the pricing and on the capacity that we can offer.” She goes on to say: “By being immediate, we save time for our clients, we offer a 24/7 service and full price visibility.” A simple mouse click finalizes the deal and the required capacity on board a certain AFKLMP flight is blocked at a specific rate. Secondly, ‘myCargo’ displays the temperature readings of the active containers. Each time a cool box arrives, departs or transits at CDG or AMS the ground handling people check the temperature within its interior shown on the watchdog of its operating control system, monitor the battery level or dry ice situation and display the data online. Through ‘my Cargo’ the results of these checks are made transparent to AFKLMP’s customers, anytime, anywhere. Ms Calonghi further announces that “in the near future the readings from all our outstations will also be visible.” This is not a matter of technical features, but the diversity of electronic systems used by local handling agents that need to be interconnected with ‘myCargo’ for securing data transmission as a precondition to make shipment integrity transparent for forwarders and producers. And she adds to this that shippers can call up information from the carrier’s electronic platform displaying the warehouse specifics and handling services offered at remote destinations such as Ouagadougou, Burkina Faso or alike seldom frequented places. “This way they know at an early stage if the airports offer cool rooms to store their goods for a while after arrival or if they miss such facilities. While knowing these specifics they can decide what kind of packaging is best to secure the integrity of their shipments from beginning to end.” This information service offered to pharma customers by AFKLMP is “a real game changer,” she concludes. Asked if other SkyTeam Cargo allies such as China Southern or Aeromexico are embedded in AFKLMP’s new pharma initiative she said not yet but wouldn’t exclude their participation at a later stage. 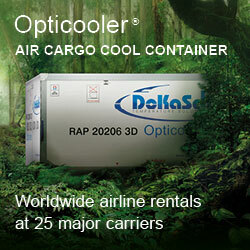 The only exception is Delta Cargo whose passenger flights lower deck capacity taking off from Paris and Amsterdam to the U.S. is fully managed by partner AFKLMP. Including pharma in the online platform ‘myCargo’ doesn’t seem to be the end of the road. Therefore, the question is what comes next. According to the manager this will happen either at the end of 2018 or the beginning of next year.